Warren Buffett’s Berkshire Hathaway owns half a billion dollars worth of Phillips 66 stock. Here’s why. Phillips 66 (NYSE:PSX) might not have the brand name that is found in a lot of Warren Buffett's stock holdings at Berkshire Hathaway (NYSE:BRK-A)(NYSE:BRK-B). But, it still is one of Buffett's biggest stock holdings as Berkshire Hathaway controls over a half a billion dollars of Phillips 66 stock. That's just enough to crack the top-25 list of stocks held by Buffett. 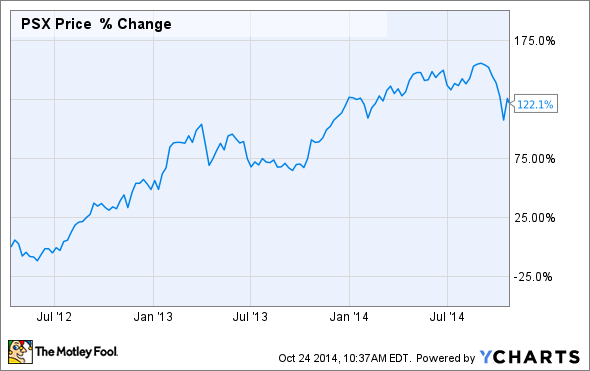 Let's take a look at why Phillips 66 is still one of Warren Buffett's top stocks. Unlike most stocks in Buffett's portfolio, he didn't choose to own Phillips 66 at first. Instead, his ownership journey started in 2008 when he bought shares of ConocoPhillips (NYSE:COP). A few years later ConocoPhillips decided to become a pure-play exploration and production company and in order to get there it packaged its midstream, chemicals and refining assets into Phillips 66. Buffett, like the rest of ConocoPhillips investors at the time, was handed shares of Phillips 66 when it was spun off in 2012. However, Buffett liked what he saw in the newly formed company and added to his position shortly thereafter, building his position in Phillips 66 to 27.2 million shares, or about 4.5% of the company's outstanding shares shortly after its spinoff. It's a position he held until late last year. Buffett started to cut his position in Phillips 66 off in late 2013. In an interesting move he handed Phillips 66 back 19 million shares worth $1.4 billion in exchange for one of its business units that Buffett wanted as a wholly owned subsidiary of Berkshire Hathaway. The business unit, which makes additives that help oil flow through pipelines, was a good strategic acquisition to pair with the company's Lubrizol segment. However, that wasn't the only time Buffett reduced his position in Phillips 66. In the second quarter of 2014 Buffett sold about a third of his remaining position in the company representing about $279 million worth of Phillips 66 stock. That left Buffett with a half a billion dollars' worth of Phillips 66 or about 1.2% of the company's outstanding shares. That's still a pretty decent sized stake in the company and not an insignificant holding for Berkshire Hathaway. Is Buffett's exit a bad omen? Clearly Warren Buffett does not see Phillips 66 as a core long-term holding for Berkshire Hathaway as he has been taking profits since the stock's value surged after being spun off from ConocoPhillips. However, just because Buffett is taking profits doesn't necessarily mean he no longer believes in the company, nor that it's a poor investment. He simply doesn't find the stock as compelling as he did when it was first spun off to unlock the value of the business, which clearly has been accomplished. Looking ahead Phillips 66's future looks strong. The company is investing billions of dollars to grow its higher margin midstream and chemicals segments, which are expected to deliver strong earnings growth over the next few years. Meanwhile, the company is making investments in its refining segment to improve its returns and increase that segment's profitability. These investments will generate a lot of cash for the company, which will enable it to continue to return large sums of capital to investors. Since being spun off the company bought back more than 10% of its outstanding shares, including the stock it repurchased from Buffett. Meanwhile, its dividend is up more than 150% over that same timeframe and should continue to grow as the share count keeps dropping while profits head higher. So, while the stock might not double again for a while it should continue to deliver strong returns in the years ahead. Phillips 66 has been a good stock for Warren Buffett. He has received an ever increasing dividend and also was able to swap some of the stock for a new portfolio company. So, even if Buffett one day sells his entire stake, Phillips 66 will likely be remembered fondly by Buffett as it has turned out to be a pretty solid investment for him.